In a continuing series on the personal impact that recent legislative and administrative proposals to restructure or severely reduce Medicaid health care will have upon vulnerable children and families, this segment focuses on Medicaid for children with special health care needs who are adopted. As described in an earlier blog, Medicaid serves a critical need for many children with special health care needs, regardless of parental income. Children in foster care or adoptive families may have additional challenges in accessing the health care they need. It is difficult to quantify the number of children waiting for adoption who have special health care needs. There is no consistent definition of “special needs” across states or the federal government. It has been estimated that on any given day, nearly half a million children are in foster care and at least one-third of those children have special needs. Some advocates and organizations argue, however, that all children in foster care have special needs due to the very factors that led to foster care itself. Irrespective of the definition one uses, it takes a very special family to adopt a child with special health care needs. There are hundreds of thousands throughout the country. This is the story of one such family. It is a story of courage and perseverance. It is the story of a beautiful child who found a permanent and loving family. It is also an instructive account of the critical importance of federal and state programs in assisting parents and families to adopt children with special health care needs; most significantly, the Medicaid program (a federal-state partnership, states guaranteed a minimum of 50% matching federal funds) and the Title IV-E Foster Care Program (states can claim limited federal funding for eligible expenses). When a child is adopted from foster care and eligible for Title IV-E, that eligibility provides adoption assistance as well as Medicaid coverage, regardless of family income, for that child until the age of 18, or in some cases, 21. This Medicaid coverage goes with the child to any state. Without Title IV-E eligibility, a child with special health care needs may or may not qualify for Medicaid, or a Medicaid waiver in a given state, such as the Katie Beckett waiver; he or she will not be considered a beneficiary who is guaranteed Medicaid health coverage in any state. That difference is key to this story about the Carrigg family, a military family, covered under Tricare, and subject, as most military families, to frequent moves to different states. The availability of Medicaid coverage to any adopting family who might need, or simply want, to move to another state for employment or other reasons, is a key factor in the ability to financially afford the necessary care involved in adopting a child with special health care needs. There is good reason for her concern. The Carrigg family’s experience also demonstrates what can be shockingly prevalent in our health care system, regardless of the requirements of the Americans with Disabilities Act – namely, ongoing health care discrimination against children and adults with disabilities. MM: How did you learn about Melanie? AC: We had been waiting to adopt a special needs child for 5 years. Melanie’s birth parents decided that they could not care for Melanie. They chose us after considering other potential families. We had several conversations about Melanie and her needs during that time. While Melanie was not in foster care, her birth parents did not feel they could parent her and she subsequently could not remain in their home, leaving adoption as the only option available. MM: What was it like when you first brought Melanie home? AC: I flew to Hawaii in early November 2012 to pick her up and fell in love with her from the first moment I held her in my arms. I had promised my son I would be back in time for his 10th birthday and we were. Bringing Melanie home was wonderful and scary all at the same time as there were a lot of unexpected challenges. Her little stomach was as big around as she was tall so I made an appointment with the pediatrician for the day after we arrived home. Melanie has Down syndrome, a congenital heart defect (Complete AV canal), as well as Glycogen Storage Disease (GSD). This is a genetic metabolic disease that makes it difficult for her to store glycogen, similar to diabetes, causing low blood sugar and other symptoms. Melanie must eat frequently, foods high in protein and carbohydrates, while avoiding sugar. GSD can cause other complications, including an impact on her heart. The pediatrician referred us to a cardiologist and we learned to our shock that three of Melanie’s ribs were broken. When he told us I remember sitting there, sobbing, trying to figure out how anyone could hurt my beautiful baby, and feeling helpless that I was not there to protect her. Melanie had to be admitted to the hospital so that an immediate investigation of her injuries, including the possibility of shaken baby syndrome. Finally, it was determined that she had likely gone into cardiac arrest at birth and during her resuscitation, hospital personnel had inadvertently broken three of her ribs, and had not properly documented it. MM: Were you all able to begin adjusting to life at home at this point? AC: It was Thanksgiving when we got Melanie back home. Almost immediately we received an urgent call from the hospital to bring her back – blood analysis had revealed her potassium levels were dangerously high and she was in severe congestive heart failure. She needed immediate open-heart surgery to repair her heart chambers and valves. While most surgeons want to wait until a child is at least six months old, and have had time to grow. Melanie could not wait. Her life was at risk. Then someone suggested we explore Medicaid as an option. 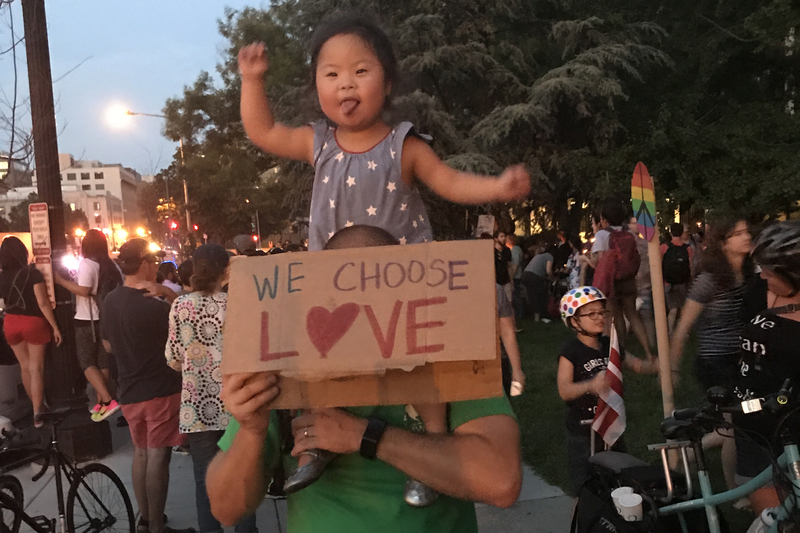 She was hospitalized and as she was not officially adopted, she was considered, for legal purposes, to be a child with special needs and an orphan; she was thus eligible for Medicaid, and we immediately enrolled her. Just 12 hours after discharge from this surgery, Melanie aspirated formula and was again hospitalized, this time with severe pneumonia. She spent Christmas and New Year’s in the hospital fighting for her life once again. Without her Medicaid coverage, her bills would have been astronomical. We had not had an opportunity to even begin her formal adoption when these crises occurred. She was finally discharged with oxygen to help her breathe and a G-tube (gastrostomy tube) to ensure there would be no danger of another aspiration. MM: How did your lives go following Melanie’s heart surgery and subsequent hospitalization? AC: My husband received orders that we were moving across the country while she was in the hospital and we were told to move despite the fact her medical team did not want her moved. The Army told us move with her or give her back; they didn’t care which but they would not stop the move. Clearly, we were never “returning” her, she is our daughter and we would give our lives for her. The move was grueling. I spent 5 days on Amtrak with her and her big brother because neither could be approved to fly for fear of a medical emergency mid-flight. We arrived in a new state and began formal adoption proceedings for Melanie; she was 5 months old at this time, still recovering but doing well. This required new home studies and extensive documentation. We had been foster parents before, so we knew the process. We applied for Title IV-E adoption assistance and were denied. The state told us that since Melanie had not been in foster care, she would not qualify for Title IV-E.
We discussed how Austin and her husband, Joshua, handled the news and decided to appeal this finding. AC: Melanie needed Medicaid health coverage so that she could access all the care she needed. We were so in debt from all the expenses, and down to one family income since Melanie needed my care full time. While Tricare was our primary insurer, we were learning there were several costs, including Melanie’s very expensive and critical treatment for GSD, that Tricare did not cover. Those alone can be more than $1,000/month. Melanie had not officially been in foster care, but there were no other options for her with her birth parents. We were simply able to adopt her before she was sent to foster care, which was the best possible option for her at six weeks. We decided to appeal the decision denying her Title IV-E coverage, based on the federal guidelines, that do not explicitly require that a child be in foster care, but meet one of three special needs requirements; Melanie did meet one of those requirements – she could not be returned to the birth parent’s home. Austin discussed the multiple challenges they faced with Melanie throughout this period of time. One in particular stands out. This was shocking but in our experience, and that of many other parents, backed by research as well, it is not uncommon. Thankfully there are many more doctors who do not share this attitude, and at 4 she finally received her 2nd cochlear implant. Looking back on it now, I wish someone had sat us down and said “being Deaf is okay, she will gain more than she loses.” I wish they would have told me that she’d hate the implants and prefer to use ASL. But like any other parent you learn as you go, following your child’s lead. MM: This article conveys just a very minor snapshot of all you and your husband have had to do to ensure Melanie’s care during the last 5 years. What lead you to adoption and how has it changed you as parents, as a family? AC: We wanted a third child but we learned we were at risk of passing along a life-threatening genetic condition – that’s why we chose to adopt. When five years had passed and it didn’t seem to be in the cards, we accepted it. We were happy just being parents to our sons and decided to focus on them and furthering our careers. Then Melanie came along, and we realized how much we were missing. She has made us all better people. When your child may die, you realize what is really important in life. We hold our kids closer. Family is our number one priority. Careers don’t matter. I know my boys are going to be amazing men. The care and compassion Melanie has created in them is unbelievable. They fight often over which one of them Melanie will live with when we are gone, and who will protect her from the injustices she faces in her life. My husband is amazing and I couldn’t do all I do without his help. We are 100% partners in everything. I know that many times having a child like Melanie tears marriages and families apart, but she has done the opposite for us. She’s brought us closer. We work together almost seamlessly when she needs us the most. A life- threatening situation pulls every member of this family into a team that works flawlessly together. Melanie is the best thing that has ever happened to our family. Not because we don’t love our boys, but because she has changed us so fundamentally. One of my sons has autism – our pediatrician said he has never seen a child with autism respond to another child the way he does with Melanie. It has taught him compassion in a way I don’t think anything else would have. I think for the first time in his life, someone was counting on him, not the other way around. He is proud of what he does for her, she depends on him and this has created greater meaning for him than anyone else in the family. Today Melanie is a thriving, joyful and engaging 5-year-old who attends school, has friends, plays with her brothers, and generally speaking, lives a “normal” and very full life. MM: Why do you advocate for changes in policy to help children like Melanie have the care they need, and also for parents like you to give children with special health care needs a permanent home? AC: Melanie has made us so happy. She has given us so much, far more than anything we have had to “give up.” And to know there are so many children just like her, looking for families. And to know that those families do not adopt because they just can’t afford it is heartbreaking. Some families decide to foster a special needs child. Not all are going to adopt – you actually have a greater guarantee of care as a foster parent. If a child remains a foster child, they have Medicaid and a foster care payment. If you adopt, you don’t have that same guarantee. That is not right. The efforts to cut Medicaid are heartbreaking. The incentive to people to adopt is lessened. I believe it should be straightforward and automatic – with none of the bureaucratic hurdles we had to jump through. Why would anyone think it is cheaper or better to pay a child welfare agency to make ongoing visits, etc., to a foster care family when that family may want to adopt but cannot afford the medical bills? We are still paying for the same health care for that child if they remain in foster care, except they get permanency and a sense of belonging in adoption. If a child has special health care needs and their birth family cannot care for them, he or she should qualify for federal adoption assistance and Medicaid. Too many parents are fostering instead of adopting. Too many children are denied the permanence of a family for the very reasons we fought – and prevailed.